Selecting a kiln is not as difficult nor confusing a task as it first appears. Since all manufacturers use the same bricks and the same element wire for all but certain specialized kilns, there are not significant differences in price or performance from one brand to another. In addition, since the bricks are available in one 9" x 4 1/2"size, kiln sizes and particularly the popular top-loading electric kilns, are standardized although some manufacturers limit their offerings to only the most popular sizes. A simplified step-by-step decision process follows focusing primarily on electric kilns. The first decision to be made in the process is whether you want--or specifically need-- gas or electric. Gas means either propane, butane or natural gas, the only difference in the kilns themselves being the size of the inexpensive orifice on each burner. Generally, firing costs for similarly sized kilns are not significantly different for gas or electric. In fact gas is often more expensive because kilns do not burn the fuel efficiently and because a great deal of heat is lost through venting. The advantage of a gas kiln is that "reduction" firing is possible. However, there are many significant disadvantages, especially for the relative novice. Obvious examples are that bisque firing is best done in the relatively clean atmosphere of an electric kiln, gas kilns require significant venting, generally being placed outdoors, and they require much more attention and care to properly fire. Generally, when larger kilns are contemplated (l5 or 20 cubic feet or more), gas is the choice because it is often easier and less expensive to install gas service than the electrical lines necessary for such large kilns. The second basic decision concerns top loading versus front loading configurations. Although front loading kilns are more desirable from the ease of loading standpoint, they are generally much more expensive. Generally, front loading kilns are built with 4 1/2 inch thick walls and top loading kilns with the bricks set on edge so the walls are only 2 1/2 inches thick. This reduces the number of bricks significantly and since the bricks themselves are the main cost of the kiln, it keeps the price down. (Three inch thick bricks are also available on some models. See comments under Wall Thickness below). On a per cubic foot basis, the "round" (and the similarly designed "oval") kilns are less expensive than the square kilns because they are easier to build and use fewer bricks (refer to "Top vs. Front Loading" above and "Kiln Sizes" below). Depending on the size and shape of the ware to be fired, a square configuration may load more effectively but that must be balanced against the initial kiln cost difference (also see kiln sizes). The advantage of a kiln made in sections is two-fold. First, they are easier to move and negotiate through doorways. Second, it is easier to make repairs, particularly replacing bottom elements, if the kiln can be taken apart. The disadvantage is that there is a slightly greater amount of heat loss due to lack of reflecting stainless steel at the section joints and there is always the danger of damaging the electrical parts or the brick itself when disassembling, storing or reassembling which might also lessen the seal between sections. Insulating firebrick, used in the vast majority of kilns, outlasts fiber although fiber heats and cools faster which can be desirable in certain instances but is generally a disadvantage. Elements are easy to replace in a brick kiln but the elements are often imbedded in the fiber meaning the fiber chamber itself, including the element, must be replaced as a unit. Repairs to fiber are much easier than brick repairs however. 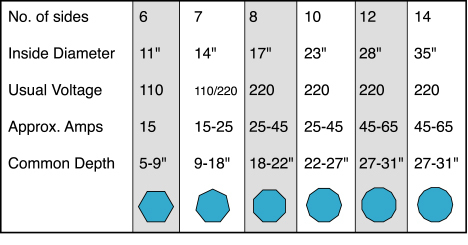 Nearly all larger electric kilns will reach at least a Cone 6 and most Cone 8 if not Cone 10. Obviously, equipped with the usual controls, a kiln can be fired to lower temperatures than its highest manufacturers rating. If repeated Cone 10 firings or there are other special firing requirements, particular attention must be paid to the wall thickness and type of element to assure satisfactory long term performance. One way to decide what size kiln you need is to draw a circle (or square) the size you think you want on newspaper and place some of your pieces within the circle to determine if that size will provide you an adequate and efficient load size. Once your desired kiln size has been determined, the adequacy of your electrical supply needs to be checked. Most 110 volt kilns require amperage close to the 15 or 20 amps usually found in such circuits and thus no other appliances can be operated on the same line at the same time the kiln is operated. A 220 volt kiln will need a dedicated line. An electrician should check that the total capacity is available and that there is room in the main breaker box to add a line if necessary. You can get a rough idea yourself by totaling the amps marked on each of your breakers, adding the amps of the kiln and comparing that to the total amps marked on the main breaker. At least a 10 to 25 percent safety factor is recommended although this can be exceeded if the kiln will never be operated at the same time as an electric dryer, air conditioner or other high-electrical usage appliance. The voltage also needs to be checked. This can be done by calling your electric company or by checking your line with a simple volt meter. Breaker box labels can NOT be relied on as 208 volts is seldom identified as such. Most residences are 220/240 volts but 208 volts, which is often found in commercial buildings and schools, is sometimes also found in homes. It is critical that the kiln match your voltage or the performance will be unacceptable. Residences have single phase electrical service. "Three phase" applies to 220/240 or 208 volt service and consists of 4 instead of 3 wires. It is sometimes found in commercial and institutional buildings. When heating as in a kiln, there is no efficiency advantage to three phase although lower amperage on each individual wire (phase) is required and thus a smaller wire capacity. An electrician can simply convert three phase service to single phase or a kiln can be ordered wired for three phase. It should also be noted that the three prong configuration of the kiln plug will vary depending on the brand and the amperage. Since the cord and plug on the kiln is very heavy duty, the wall receptacle should be changed if necessary, not the kiln plug. Also note that the 30 amp plug on most electric dryers is unique to dryers and thus a kiln with a 30 amp plug will not fit in a dryer outlet. By law an adapter is not available so it is best to change the plug end on the dryer and the receptacle in the wall. Kiln bricks come in two thicknesses, 2 1/2 inches and 3 inches. An analysis of the energy used for heat storage in the brick (the energy absorbed by the brick itself) versus the energy lost through the brick shows that unless you plan a soak or a long firing at very high temperatures (where energy loss becomes more pronounced) or need to cool very slowly such as in crystal glazes, then the advantage of the thicker brick and walls is almost negligible. A few kiln manufacturers also offer models with extra insulation between the brick and stainless steel cover. Again, unless you will be doing very high temperature firings (Cone 8-10), the extra cost is probably not justified. Energy savings will be quite minimal. What amperage fuses or circuit breaker do you need to fuse a kiln with? The amperage rating of the fuse or circuit breaker needs to be 125% higher than the full load amps of the kiln. This is according to the National Electrical Code. You then need to bump this up to the next standard size fuse or circuit breaker. A kiln has a full load amp rating of 60 amps. 60 x 1.25 = 75 amps. The next closest standard size breaker is an 80 amp breaker. A typical 10-sided kiln usually has a full load amp rating of 48 amps. 48 x 1.25 = 60 amps. Use a 60 amp breaker. The breaker/fuse amps is typically mentioned in the kiln electrical data located on the wiring diagram. The stardard wire sizes below are measured in gauge (thickness) of the copper wire. The higher the amperage, the larger the wire required. If you are wiring a kiln over 100' from the breaker panel, you will typically need to use one size larger wire (smaller gauge number). It is best to have this work sone by a licensed electrician. Below are typical amp and wire size requirements. 150 amps = 2/0 gauge copper (pronounced "two aught") etc. Elements can last anywhere from 150 to 300 or more firings depending on what is being fired and their proper care. However, firing these electric kilns to Cone 10 will wear them out much faster and after 30 to 50 Cone 10 firings in a 2.5 inch brick-walled kiln, the kiln will show degraded performance, slower and slower firings until this kiln is no longer capable of reaching high temperatures even though the elements are not necessarily burned out or broken. All kiln manufacturers normally use the same wire for elements and thus for the same size kiln with the same performance rating, the same elements will be used and the kilns will use the same amount of electricity. There is a newer APM element wire available from Skutt Kilns and offered by some other kiln manufacturers as an upgrade option but they are quite expensive and the cost/benefit remains a little bit of a question. Kiln controls can range all the way from a simple on/off switch to fully programmable computers. Most kilns come minimally equipped with a variable switch (similar to a rheostat in function) and a W.P. Dawson Kiln Sitter which mechanically shuts the kiln off by use of an expendable cone (a piece of clay formulated to bend at a specific temperature). To this a safety timer is usually added which over-rides other controls and shuts the kiln off when a predetermined amount of time has elapsed. With these controls the operator will have to return to turn the kiln up at least twice during a standard 8 hour firing. Several kiln manufacturers also offer a feature whereby the kiln will ramp up automatically. The ultimate is the computer controller which permits almost unlimited hands-off control over the entire process. They are very simple to use and generally have several preset programs for normal firing needs. They also permit very slow ramping up or down between different temperatures as well as the ability to soak or hold a temperature which can be very useful in overcoming certain glaze defects. Saving one kiln load in this manner can easily cover the added cost of the controller to say nothing of the savings in your time and mental anguish. Most kilns on the market have all elements controlled as a single zone. Difference in temperature uniformity due to greater heat loss at the top and bottom is compensated for with different rated elements top to bottom. This is normally effective except when loads are uneven or when an element needs to be replaced. Elements do degrade over time and installation of an entire set of new elements to regain uniformity for temperamental glaze firings is expensive. Thus, several kiln manufacturers offer zone controls, either manual or automatic in some cases. A 50 amp or less kiln with a plug usually does not require a permit although local codes may vary. The kiln should be placed on a non-flammable surface (not wood or linoleum) and be kept 2 feet from a one-hour firewall which is what is usually found on garage walls that are shared with living quarters. Obviously, flammables should not be stored nearby. Venting of the kiln is usually not necessary from a strictly health point of view under most firing conditions. Although some hazardous gases such as sulfur and carbon monoxide are emitted, studies have shown that they dissipate to well below dangerous threshold levels if the kiln is in an open area and there is air circulation such as in a garage. However, there may well be detectable odors which you may want to exhaust to the outside. There are several types of vents. A few manufacturers offer extra cost built-in venting whereby the fumes are removed from the side at various heights. There are also fan powered hood vents and vents that sit below the kiln and draw the fumes through the kiln and out the bottom. Venting systems that draw air through the kiln can improve the vibrancy of colors by introducing more oxygen to the kiln atmosphere and also eliminate the need to prop open the top or deal with peephole plugs during the initial firing stage. • A shelf on the brick bottom is recommended to protect the brick. Note that while a longer firing will increase the energy cost, it will not be a large increase because the kiln will not be on full power any longer and the .6 factor in "C" of the formula would be lower. The formula assumes a normal, even increase 8 hour firing. Greater accuracy can be achieved by following the same procedure for multiple smaller time segments. A 3 hour drying on the lowest setting might use a factor of .1 in calculating "C", for instance, and then .6 or .7 for the remaining time.